Despite his intense interest in hockey, Ryan doesn’t care much for hockey cards. We have them all over the house in various stacks and boxes, but he doesn’t often look at them. Trying to figure out how to engage him in something I thought would be right up his alley became a challenge. We tried variations of “pack wars” where Ryan and sister Riley would each get a pack of cards and then “compete” to see whose pack contained a player with the most goals, highest total of penalty minutes, etc. the entire thing plays out like the card game war, with one of them ending up with the entire stack. This approach was mildly more successful. I figured Ryan would enjoy the stats on the back of the cards because he is so good with numbers. But the only hockey statistic that interests him is standings. There is something about the way the numbers are laid out, and the way the columns have to match — goals allowed equaling goals scored — that appeals to his particular brain wiring. It is black and white with zero shades of gray. He has spent countless hours looking through the standings of various NHL seasons and typing up standings of his own imaginary hockey league. Hockey cards can act as a useful distraction. One weekend while running errands at Target — always among his least-favorite activities — we rewarded Ryan for his better-than-usual behavior with a pack of cards at checkout. When we got home, Ryan asked me to play pack wars. I looked over the cards, but hadn’t seen any of this variety before. This particular set had action photos on the front, but rather than any statistics, the back contained text describing the exact game where the photo had been taken. When I explained to Ryan that it would be difficult to play pack wars with this set because of the lack of numbers, he looked them over carefully, realized all the games being described were from the 2010-11 season, and asked me to quiz him anyway. He wanted me to read him the text from the back of the card, omitting only the final score. He would then use the rest of the information to figure out the date and score of the game, as well as each team’s record before and after the game. We tried one and Ryan nailed it. Now this was not a surprise. He has a remarkable memory — especially on a subject (hockey standings) in which he had such an intense interest. Still, I had no idea just how remarkable until this exercise. There were 40 cards in the set and Ryan got 39 of them correct. There are 1,230 games in an NHL regular season. It was clear that Ryan had committed the results of all 1,230 from 2010-11 to memory: teams, locations, final scores, and each team’s record and place in the standings before and after each game. Just thinking about the amount of data his brain was processing made my head hurt. I congratulated him with each successful answer but Ryan was having none of it — he insisted that he was right on that 40th card. 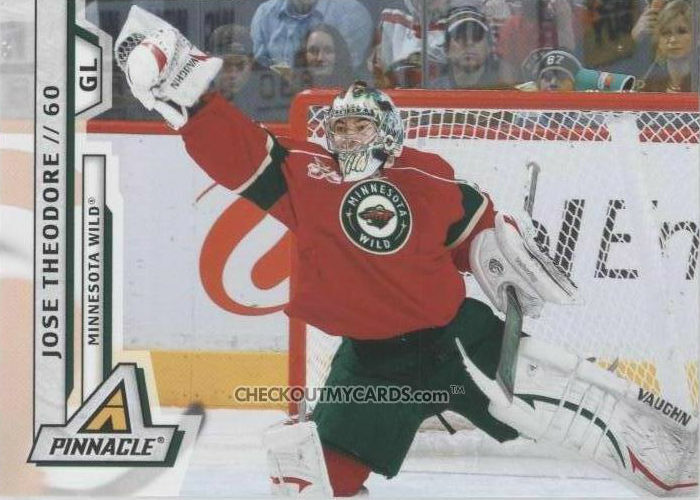 The card in question was Panini Pinnacle card #101, Minnesota Wild goalie Jose Theodore. The front has a picture of him making a glove save. ST. PAUL, Minn. — Flashing the kind of leather that would make members of the Twins — the Wild’s Twin Cities counterpart — ooh and ahh, Jose Theodore showed the moves of a shortstop when he got peppered with 44 shots by the Coyotes on Dec. 1, 2010. 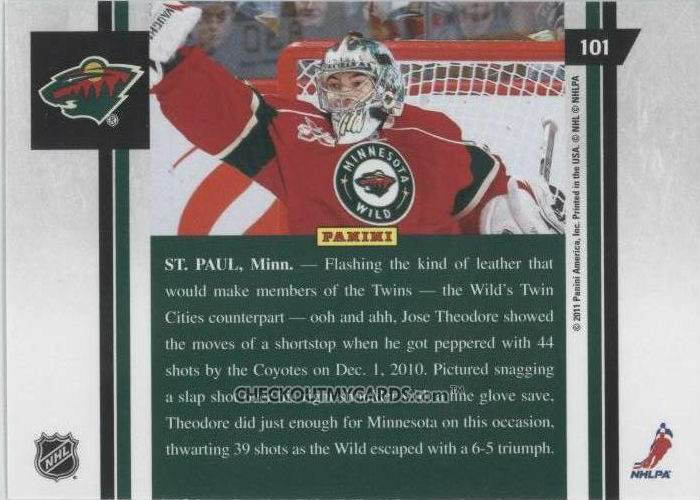 Pictured snagging a slap shot over his right shoulder with a fine glove save, Theodore did just enough for Minnesota on this occasion, thwarting 39 shots as the Wild escaped with a 6-5 triumph. Ryan has a phrase he likes to use on the occasions he catches his parents in a mistake. It goes from amusing to annoying pretty quickly. Ryan insisted that the 6-5 game in the description could not have taken place on Dec. 1, because even though the Coyotes had played in Minnesota that day, the final score had been 4-2 for the Coyotes. according to Ryan, the 6-5 game in question had taken place on Jan. 2. After his performance on the other 39 cards, I had my money on Ryan. We went to NHL.com to check. Sure enough, Ryan was correct. There it was, plain as day: Dec. 1, 2010, Phoenix 4, Minnesota 2. And then on the January results page: Jan. 2, 2011, Minnesota 6, Phoenix 5. Moments like this one are always bittersweet. For just as they confirm Ryan’s remarkable intelligence, so to do they confirm that his brain is simply not wired like other people’s. And while that is something we long ago accepted, it can still hurt to see it so starkly portrayed. I have always believed that Ryan will eventually find his niche in some field in which the overdeveloped areas of his brain will be an asset and not a hindrance. Actuary? Computer programmer? Forensic accountant? After this exercise, I’ve got another potential field for him: hockey card fact-checker. Oh, and Panini, my son has a message for you. I love it! As an avid hockey fan (of the MN Wild no less!) 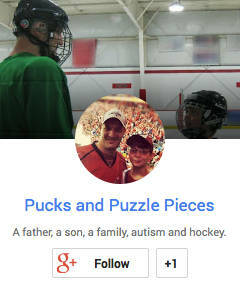 living in the State of Hockey, and an Autism mom, I have to say I love your blog. Great Story! I hope that he will go into the IT field. I can get him a job that way. You should also tell everyone what an amazing speller he is, too! Just found your blog and this post and I had to comment on our similarities. We too are in the Northeast. We have three kids, and our middle (boy) is on the spectrum. His sport is baseball though, and in particular general trivia around the red sox. We got him a ‘fact a day’ type calendar for christmas, and he immediately found an error on the outside box, as well as one in the month of January. Like you, I knew he was right.